Top Big Data Tools And Why We Use Them? We have discussed a lot about Big Data, Hadoop, and business intelligence tools here at the site. Today, we will discuss some of the top big data tools and why we are using those. These big data tools will help you to get into the Hadoop world easily. We will discuss the Hadoop tools of all the areas like top Hadoop distributions, best BI tools for Hadoop, free Hadoop datasets locations and much more. Let’s start and see what are the top big data tools one should use and why we are using those. 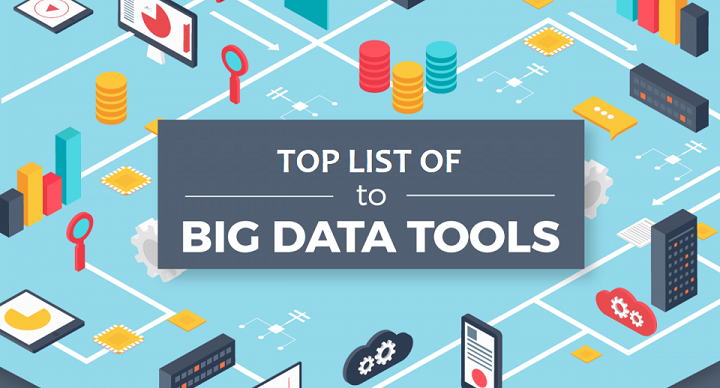 Most of these big data tools and technologies may be known to you while some might be new. We will discuss all these big data tools and technologies in details here. Hadoop is a leading tool for big data analysis and is a top big data tool as well. Moreover, Hadoop is a framework for the big data analysis and there are many other tools in Hadoop ecosystems. For the infrastructure of the Hadoop, there are many Hadoop cloud service providers which you can use. These are mainly used for file storage and transfer. Inside Hadoop ecosystem, we have the tools like Hive, Pig, MapReduce, Sqoop, HDFS, Oozie, Flume, and many others as well for the different purpose. Hadoop works on Java platform and is a top project of Apache software foundation. Hadoop stores all your files on HDFS (check HDFS Tutorial for details). You can analyze all the structured files using Hive while structured and semi-structured files can be analyzed using Pig. For RDBMS to Hadoop and vice-versa data transfer, you can use Sqoop (check Sqoop Tutorial for details). HDInsight is a product in the cloud by Microsoft which works on windows. It is powered by Apache Hadoop and you can do the same work on HDInsight as well. HDInsight provides low-cost infrastructure for the Hadoop storage. NoSQL is not the only SQL which is used to store the unstructured data. Where SQL allows you to store structured data, NoSQL allows you to store both structured and unstructured data. This is the main reason; NoSQL databases are the backbone of Hadoop ecosystems. No particular schema is needed when you are working with NoSQL databases and each row will have their own set of column values. Another benefit of using the NoSQL databases are the better performance while storing a massive amount of data. MongoDB, HBase, and Cassandra are the leading NoSQL databases used in Big Data. Hive is a very important tool in the Hadoop ecosystem and is a leading big data tool as well developed by Facebook. This is a distributed data management tool for Hadoop and has an SQL-like a query language called Hive query language (HQL). If you are familiar with SQL, you will find working on Hive easy as many concepts are similar like Hive Partitioning, Hive bucketing, Hive joins etc. Hive is also a top-level Apache Foundation project. Hive is majorly used for data mining purpose and works on the top of Hadoop. Pig is another leading free big data tool and an important ecosystem of Hadoop system. It was primarily developed at Yahoo to save the time and resources involved in MapReduce programs. You don’t need to define the schema before storing any file and directly you can start working. It is a free big data tool which you can use. Both Hive and Pig almost fulfill the same situation. You can check Hive vs Pig for the differences. Talend is another open source company and is a leading ETL tool used in Big Data industry. It offers a number of data products used in the data analytics industry. Talend offers many products like Big Data Integration, Master Data Management (MDM) which combines real-time data, applications, and process integration with embedded data quality and stewardship. As Talend is an open source company and free and so is an ideal ETL and integration solution for all the stage of needs. Almost all the companies working on data. You might have not much aware of OpenRefine but it an extremely important and free big data tools 2017. It is used for cleaning messy data and was earlier known as GoogleRefine. can explore data, Clean, Transform, Reconcile and Match Data easily. You can check the below video for more details. DataCleaner is a premier Big Data tool and an open source data quality solution available for free. 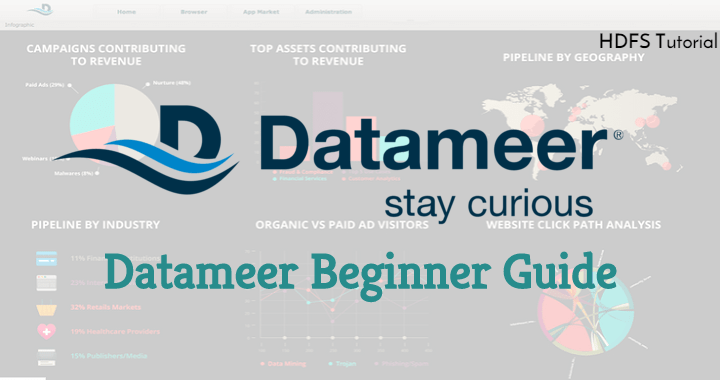 DataCleaner is mainly the pre-stage of the data visualization where only structured and clean data can be used. You can clean the semi-structured data using DataCleaner and then can connect with any visualization tool for dashboards and reporting. DataCleaner also offers data warehousing and data management services. You can use the professional version of DataCleaner free for 30 Days. RapidMiner is a leading tool for predictive analysis and is a leading big data tool 2017. It is a great tool used by the Fortune 500 companies like PayPal, Deloitte, eBay, and Cisco has an awesome supported community. This is a paid tool (free plan is also available) but worth using it for predictive analysis and data science. Tableau is a leading data visualization tool in the industry which is used to visualize the structured data. You can connect Hive directly to Tableau and start visualizing the data. If you are new to Tableau and want to learn from industry experts, you should try our Tableau online training to master it. It is a paid tool but you can try their 14-days of the free trial. Also, they have a free product called Tableau public which you can use free forever. You can connect Tableau with over 100 data sources and visualize those in the way business can have all the insight. Tableau is also a leading BI tool for Hadoop and you can check the comparison with other BI tools here. Import.io is a leading data extraction tool used in the industry widely. It enables the user to convert any website into structured, machine-readable data with no coding required. Using some simple point and click UI available on Import.io, you can transform any web page to any easy-to-use spreadsheet. Which you can further analyze, visualize and take a business decision. It is a paid tool but the free trial is available which you can use to try. Sqoop is another leading Hadoop ecosystem tool used for import and export operation. You can import data from RDBMS to Hadoop and export Hadoop data to RDBMS easily using Sqoop. You can check our Sqoop tutorial for details which is free and can buy Sqoop playbook which is just available at $2.99. These were some of the best big data tools which you can use if you are working on the data analysis. There are many other tools which are quite good and can be mentioned here. Our team is analyzing those and will keep the post updated with those tools as well. For now, let us know which all tools you use in your Big Data and Hadoop journey.